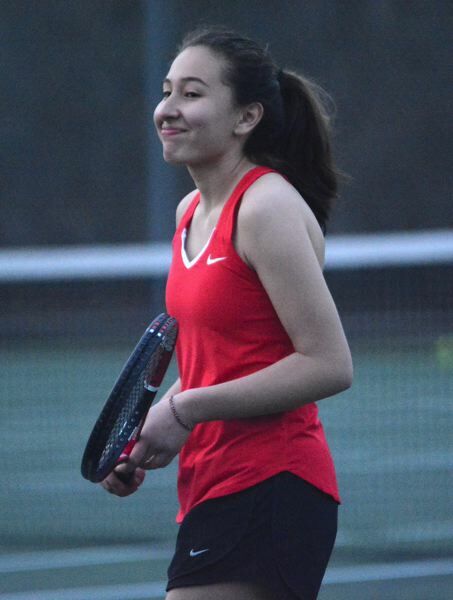 The Clackamas girls tennis team came through in the final set of the night to claim a 5-3 dual win over Barlow last Thursday to claim round one in what many coaches expect to be the showdown for this year's Mount Hood Conference crown. After splitting the first two sets on the No. 4 doubles court, the Clackamas pair of Kate Parkins and Heidi Thiele never trailed in the third. Parkins delivered an ace to put the Clackamas pair up 2-0 early. Later in the set, Parkins hit a sharp-angled return that left Barlow no play on the ball, and Thiele sliced a backhand shot that slipped underneath a Bruins racquet. The Cavaliers would break serve to go on top 4-1. That is when things got dicey. The sun had dipped below the horizon, leaving the last match of the day to finish in vanishing light. The stadium lights from the football field across campus supplied enough of a glimmer for the players to get through the last few games. The teams would trade games as the courts grew darker. Parkins closed out the match on the Cavs' second opportunity, coming to the net and punching a backhand out the side of the court. "I knew if I went that direction, it would be a hard ball to get," Parkins said. "I just wanted to be sure not to hit it to them." The Cavs saw Barlow turn back four consecutive set points in the opener, turning the tide for the Bruins to take the first set 7-5 when Claire Paskett reached up high and connected for a backhand winner at the net. "We just had to forget about it," Parkins said. "It was a good time for us to comeback when they were least expecting it." The Cavs blitzed through the second set 6-0 — a key decision that turned the dual-meet tiebreakers to the Clackamas side. The Cavs finished plus-16 in games won. 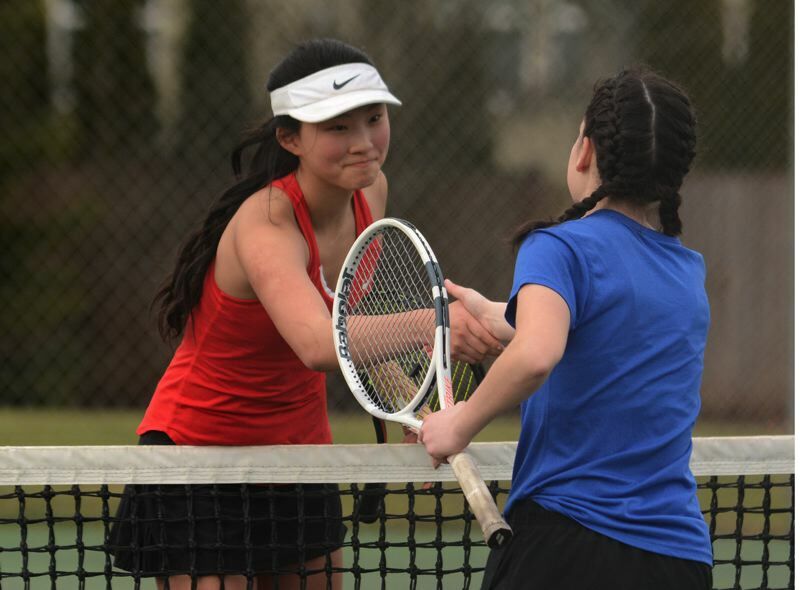 Clackamas swept the singles ladder highlighted by Elise Kang's 6-4, 6-4 win over Barlow senior Grace Maxey in a rematch on last year's district final. "Last year's result motivated me to work harder and harder," Kang said. "I got to match point and didn't want to go for it too much. I was just trying to force her into a mistake." Olivia Morris, the only senior in the Cavs' singles lineup, scored a three-set win in No. 2 singles. She moved in front early in the third after approaching the net and hitting four straight volleys — the last being a lob that stretched out Barlow's Angelina Utt for an errant return. "I wanted to be smart about it, keep the ball in and always be ready for it to come back," Morris said. "I got back to playing with the flow of the match, and focused more on consistency than hitting winners." Meiling Masterson and Olivia Terveen won straight-set bouts in the bottom half of the singles ladder. This story is slated for our March 20, print edition.